I think one of the most important things in any relationship is finding someone who can make you laugh. Or who you can laugh along with. I’m a HUGE goofball (and pretty weird), so finding someone that understands my sense of humor is essential. Oh, I think I forgot to tell you guys I am dating. Not serious marriage dating, just having fun and searching for that little bit of laughter in my life. Good, right? Well obviously for whoever I date it’s good. I mean, what kind of guy can resist freshly baked cookies and mexican food for dinner? There are reasons I can’t go around cooking for all of my dates — food is a serious attachment. That’s why I only bake the life-changing cookies when I REALLY like someone. Because after those cookies, there is no turning back. Anyway I’ll keep you posted on all of that… as if you care. But let’s pretend you do, because frankly I can’t just talk about tacos all day. MMMMMMM TACOS. Tacos are always good. ALWAYS! And that’s exactly why I made them for you! 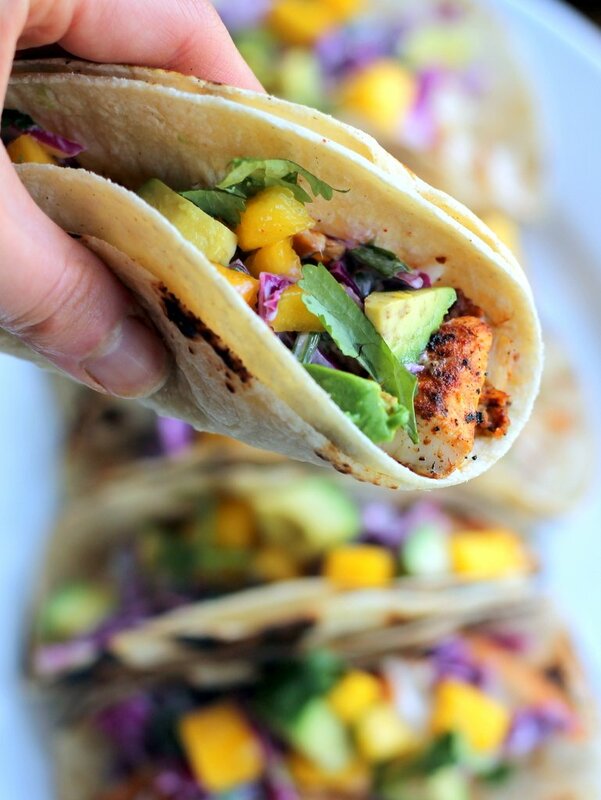 These fish tacos are marinated with lime, olive oil, chili powder, garlic, cumin honey, sea salt, and a little cayenne pepper. Then they are grilled to perfection (or you can pan-fry them). I really love the slaw that goes on top, too! It’s made with sour cream, lime juice, and cilantro; the crunch of the cabbage is my favorite part. 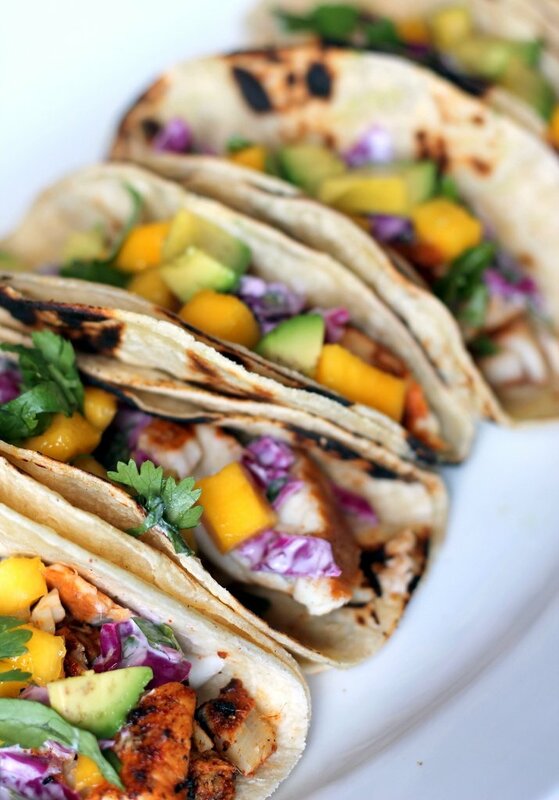 Last but not least, you always need a little avocado, mango and cilantro to really bring it all together. 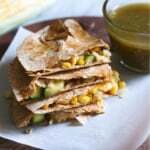 I served mine in toasted corn tortillas, but flour or low-carb would also work well; it’s up to you! Consider this another man-bait recipe. 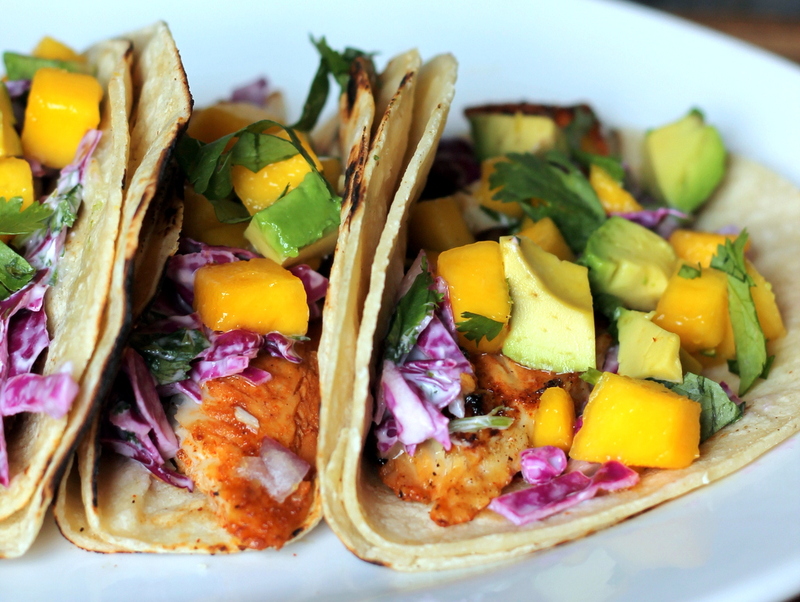 A delicious chili-lime fish taco with a sour cream slaw, sweet mango, and avocado. The perfect Summer meal! Preheat grill to medium-high heat. Place fish in large ziploc bag and add olive oil, lime juice, honey, garlic, chili powder, cumin, and cayenne pepper. Season with salt and pepper. Close bag and massage seasonings into fish. Let marinade for 20 minutes. 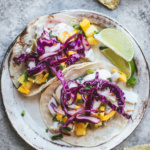 Prepare slaw: In a medium bowl combine cabbage, cilantro, sour cream, lime juice, and salt and pepper to taste. Place in refrigerator. 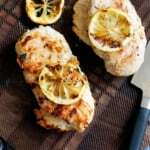 Remove fish from marinade and place onto hot grill. Grill fish for 3-5 minutes each side, it will vary depending on the temperature of your grill. Typically the second side will take less time. Remove fish to hot plate. Grill tortillas for 10-20 seconds each side. 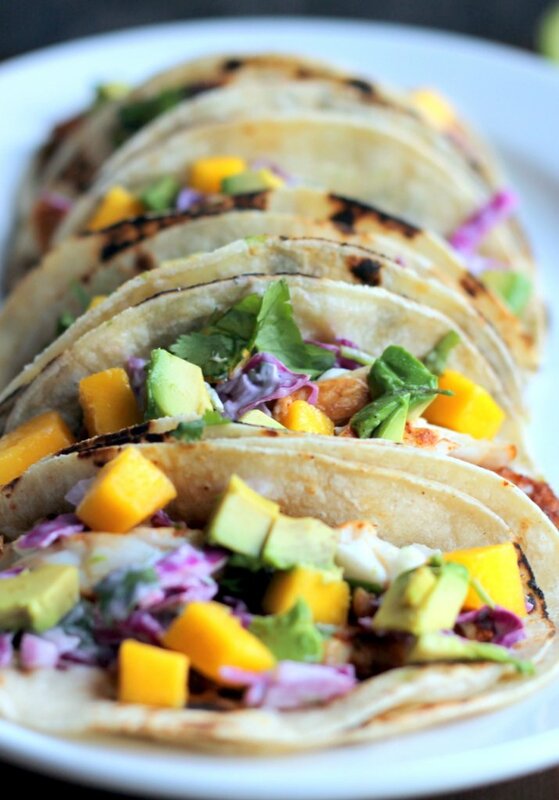 Divide fish equally into tortillas, add slaw, and mango and avocado. Garnish with extra cilantro, if desired. Makes 8 tacos total; 2 tacos each. 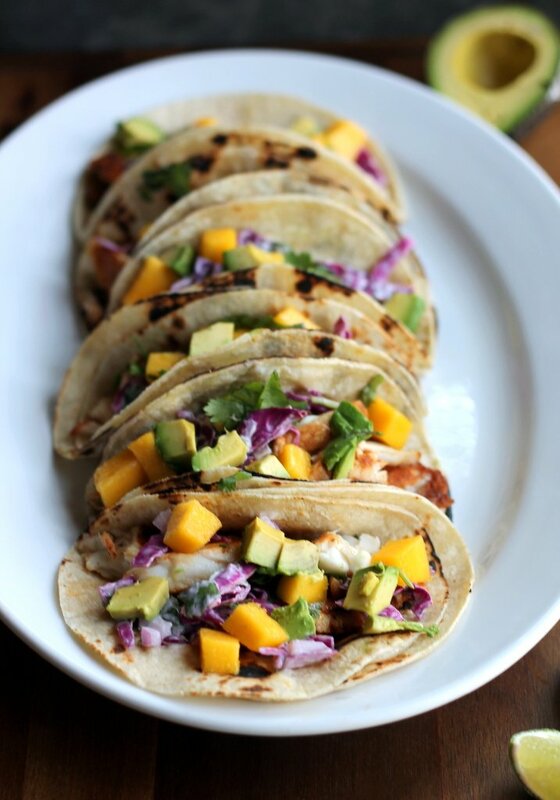 69 Responses to "Grilled Chili-Lime Fish Tacos with Sour Cream Cabbage Slaw + Mango & Avocado"
SO pretty! Love a mexican twist on seafood… I’m making chipotle shrimp tonight! Lovely as always, thank you for sharing! I love fish tacos! These sound like a wonderful combination!! These would not be bait for either me or my husband, with the fish. 🙂 I like fish better than he does, but tilapia has never tasted good to me. I would probably make them with chicken (I know, borrrrrinnng!) because the rest of them sound wonderful. Laughter is a very important part of relationships. My husband and I did a lot of emailing before we were officially courting, and I remember him getting ‘mad’ at me for making him laugh (turns out he didn’t want to fall in love long distance). We are now approaching our 5th anniversary (on the 28th of this month) and we spend a lot of time laughing. I hope you can find someone to laugh and be silly with. When you find the right one, it keeps getting better. Fish tacos happening this week. Done! Haha – I love this thought – definitely hold out on making the best cookie recipes until you’re pretty sure he’s sticking around! 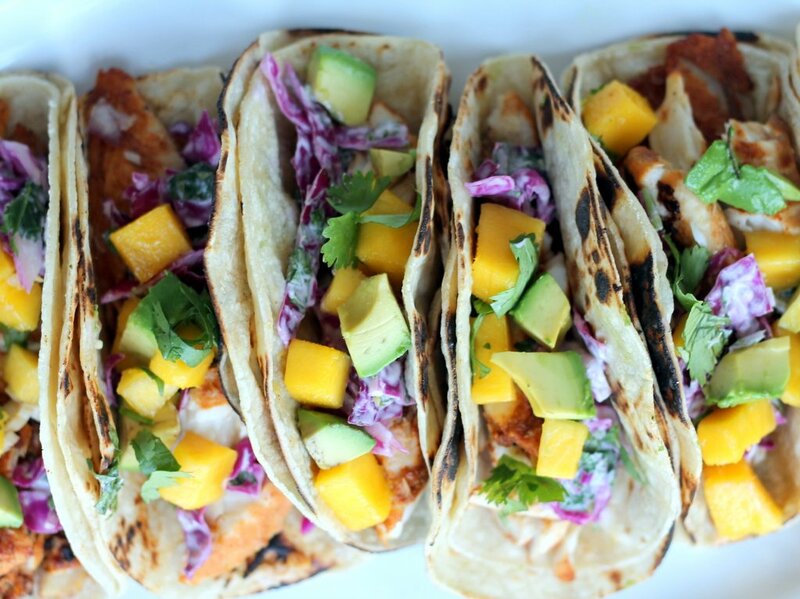 Making fish tacos though – that’s a win-win scenario. I made fish tacos for my husband pretty early in our dating years…he still requests them! Can't friggin' wait to try this recipe! I’ve never tried slaw on fish tacos. It looks very interesting. Look forward to try it. Thanks. Making these for my hubby Thursday. Cannot wait!!! those cookies have changed my life, indeed. (I keep frozen balls of prepped cookie dough in my freezer to make a hot freah cookie at a moments notice.) loved your analysis in that paragraph. 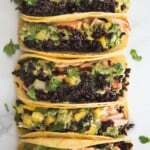 and these tacos look delicious! Mmmm, these look perfect for summer! Thanks for sharing. “Consider this another man-bait recipe.” haha to say the least, these tacos were delicious! Thanks for the recipe, I loved how the photos came out! mmm, I've got to try this! 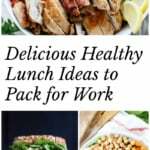 Desdi bet you love this recipe. Keep wooing the men with food, as if your smile isn’t enough. Sheesh, you have it all. I am trying to add more fish to our diet…this looks like a great start! I am making this tomorrow but using shrimp instead! Made these last night for dinner. The flavor was great…I was going to ask you about using greek yogurt instead of sour cream, but it looks like another commenter already tried that with some success. I will definitely be making these again. Thank you for the wonderful recipes…I love trying them out. OH! and I can’t leave without telling you what my husband (a slowly-converted-meat-and-potatoes-guy)…I was a bit nervous about the mango with him, but he said “and these mangos are freaking YUMMY!” hahaha. SOLD. I'm going to make this next weekend! Made these last night with Mahi Mahi. Absolutely delicious! These were very good…next time I will leave out the cumin. Just not a fan of it and I knew I probably should have left it out, but wanted to follow the recipe and tweek from there. My mango was not ripe (ugh) so we used some fresh pineapple instead…it was a great alternate. Thanks for sharing!! Tried this recipe tonight and it was a total winner! Will use this Coleslaw recipe with other dishes. Thanks much!!! i'm wondering how the slaw would turn out if you added a little sirachi sauce for added spice? any thoughts? any thoughts on adding sirachi sauce to slaw? I made these last night and everyone really enjoyed them! I mixed the slaw about 20-30 mins before so it had time to sit. I did not add lime juice to the slaw because I was scared it was going to make the sour cream curdle. Instead, I set a bowl of lime wedges out to squeeze over the top before eating. It was great that way!! The only thing I would change next time is maybe adding a little Cajun seasoning to the fish right before grilling. I will make this again. Thank you!! Made the fishing tacos for dinner tonight. I used Cod, instead of Talipia and pineapple instead of Mango. The slaw was the star anyway, so fresh and delicious! I would NEVER use tilapia! It is the dirtiest most contaminated of all fishes! I like your recipes, but you really need to do a bit more research about soe of your ingredients. Hi Alison! Thanks for your ever-so-kind comment about the use of tilapia. First off, I wrote this recipe over three years ago when much of the information on tilapia wasn’t available and I wasn’t educated enough on the issues in the industry. Secondly, if you have a problem with tilapia, then use a different fish to your liking! Do you think I could use Haddock in place of tilapia? This looks amazing! I haven’t tried it but I think that should be just fine! This recipe was great!! Brought some summer memories back on a cold fall evening. Didn’t use the sour cream in the slaw but made a chipotle creama with it instead. 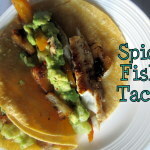 Finally found a fish taco recipe that my husband loves! Perfect! Nothing like a little summer when it’s cold out. Glad you both enjoyed! Monique, I made this tonight and it was great! I didn’t have tortillas, so I made bowls and served tortilla chips with the fish. And I added a little grated carrot to the slaw. I love how you include carrot in some of your other cabbage slaws! Thanks for another keeper of a recipe!